I wish I could say this beautiful tatted doily is my work, but it isn't! Elizabeth in MA and I corresponded earlier this summer regarding the mistake in the Daffodil Doily pattern in Learn to Tat by Janette Baker. We had both attempted to make our own corrections to the doily, and Elizabeth asked if she could send me one of hers. Of course I said yes! Elizabeth wrote me a lovely note, and she let me know that the book is now available with the corrections... good news for those of us who want to encourage others to learn to tat! Thank you for the lovely gift, Elizabeth! I will treasure it always! On the home front... I have had very little time to tat or work on my socks. Dave has gotten the bug to work on the house! He gets inspired every once in a while, and there's just no stopping him! The reason for this bug? My nephew's wedding is this weekend, and my mom will be coming home with us afterwards and spending a week! Dave spent a whole week cleaning the back porch. He's been wanting a "picture room" for several years, and now he has it! He found all the pictures that have been in storage for several years, cleaned them up, and then started hanging them. Of course, I had to step in and give my advice. I'm sure Dave would have preferred that I stay in the living room and tat, but I can be very particular! Our back porch is one of my mom's favorite places to sit, and now she'll really be able to enjoy it when she visits! We've also hung some of my favorite pieces in the living room: an angel I crocheted, a ship that Mom crocheted, a reproduction counted cross stitch sampler, and one of my dad's favorite pictures. I'll post pictures of them later. Your rainbow is strongly shaded yellow and blue. What is says about you: You are a joyful person. You appreciate friends who get along with one another. You're good at getting people to like you. You share hobbies with friends and like trying to fit into their routines. I'd say this one is pretty accurate! I have fun taking some of these little quizzes, but I seldom publish the results. There's something very appealing about rainbows, and I guess this shows that each of our rainbows is just a little different... nothing wrong with that! It's been a busy back-to-school week. I love back-to-school week! The kids are excited to be there, and I'm happy to see them! The best part of my job is that I get to see all the kids and learn all their names. They love seeing a familiar face at the front door, and I get lots of little hugs! Anyway... I really needed a good pair of shoes for school, and I bought myself a pair of clogs... the kind doctors and nurses like to wear (I'm terrible with brand names, so I don't remember what they are). The just called out for hand-knit socks! Ta da! I finished my first sock yesterday morning before heading off to school. I'll start the second one today. Yes, it took me a whole week to knit this sock, but it was well worth the time invested! I kind of wish I'd chosen a flashier sock yarn from my stash, but at the time, this brown called out to me. Oh, look! Brown is at the top of my rainbow! It must have been meant to be! P.S. - The yarn is Patons Kroy Socks from Hobby Lobby, and I used size 2 double points. ...to try out my new shuttle and thread from LadyShuttleMaker! Orland, our weekend mailman, had to come knocking on the door to get my attention (I was busy doing laundry with the music cranked up... yes, I do manage to get a few household chores done once in a while!). I tried to be a good girl and get some cleaning done, but the call of the shuttle and thread was too strong! 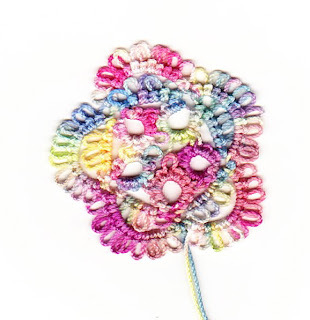 This is Flower 5 from page 75 of Projects in Tatting by Sheila York. The thread is size 20 Confetti Sprinkles... I LOVE it! When I was visiting Alison and family earlier in the week, Aidan kept asking me what my favorite color is. It's blue, of course! I think Aidan was hoping I'd change my mind and say green, but I didn't. 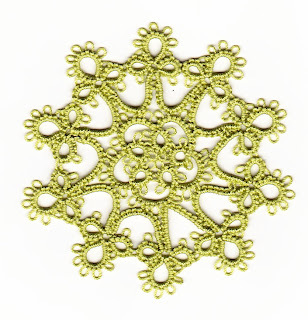 However, when I decided I wanted to tat another of this pretty little motif from Projects in Tatting by Sheila York, green just seemed to be the perfect color. Andrea's favorite color is green, and my maiden name is Green. I guess it was just meant to be! This time I managed to join in all the correct places, and I didn't snip any picots! This is a good thing, because I wanted some new coasters, and snipped picots would have called out to me constantly! Now I need to work on my centering techniques, but overall I'm very happy with my new coaster! ...and this is not something I wanted to happen. When I was snipping my final thread, I snipped a picot! I was already dissatisfied with my work on this motif, because I missed the last join. I knew I would make it over again, but to snip a picot! I can't believe I did that! 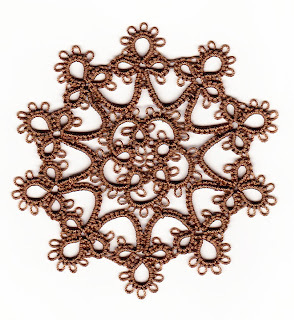 This motif is "Round Paperweight Motif" from Projects in Tatting by Sheila York, and the pattern is on page 54. I can't remember where I found this book, but I've had it for a while. If you can find a copy (it's from 1985), it's well worth having. There are many projects that I would love to make. The thread is size 20 Lizbeth #691, Mocha Brown Med. Thanks to tons of encouragement from Carolina, I kept trying to fix my date problem. I finally did what I probably should have done in the first place... I searched Blogger Help. Guess what? There was an answer! Sometimes I just need someone else to state the problem in a new way so that I know what to look for. Thanks for all your help, Carolina! I have a fancy page now, but I still don't have my dates. When I go into Edit Posts, all the dates are there. When I check my settings for my page layout, everything is checked. Earlier this afternoon, I couldn't access my blog for about two hours! I figure Blogger must be having a problem today. Maybe everything will clear up tomorrow. I've spent most of the day playing with my computer... no tatting, no knitting, no crocheting, no bobbin lace, no Kumihimo, no weaving, no reading... I feel like I've wasted the whole day! Well, it appears that I've lost all my dates, and I didn't have any luck with trying to make my page fancy. I'll keep trying, though! I love a challenge! I don't know what I've done, but I've done it! I hope to get all my info back on my page, but I'm not sure how I got where I am. I'm too tired to deal with it now... maybe tomorrow! Focusing on the gifts for Yvette's shower left me very little time for blogging. While I was busy crocheting and tatting, some wonderful items arrived in the mail! I received these gorgeous acorn bobbins from Dave at Grizzly Mountain Arts... I can't wait to get back to my bobbin lace! Thank you so much, Dave! There's nothing like using beautiful tools! Next I received my beautiful prize from Jon... her Magic Moment snowflake. Color me surprised! Jon also included a beautiful bookmark and cell phone fob! Jon, you're the best! Thank you very much! What more could a girl ask for? 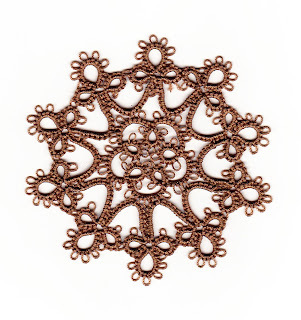 How about a wonderful tatting book and a beautiful beaded flower? They're from Laura. How did she know that anything with beads fascinates me? As for the book... I think I've found the edging I want to use for daughter Joanne's wedding hanky in this little gem! Laura, you made my day with these wonderful, thoughtful gifts. Thank you! No, I didn't receive this in the mail. Today I finished my second Magic Moment snowflake. I tatted this in Altin Basak #3003, size 50. My next quest is to find the perfect 3" motif for some coasters. Anyone have a suggestion? Yvette was very pleased with her gifts! Erich wasn't quite sure what to make of them! After all the presents were opened, he asked me, "So, what were those "things" you made for Yvette?" I explained, and he replied, "Oh..." Clearly, Erich was not quite as impressed as Yvette was! No, Mom! Erich didn't really use the hanky... we were just having a little fun when Yvette wasn't looking! I finished Yvette's bag in the nick of time! Last night, around 9, I finished tying off the second drawstring. Good thing... the shower's at 1 p.m. today! I love this pattern, and I've made several bags for brides through the years. The pattern is by Jacqueline Young and can be found in Donna Kooler's Encyclopedia of Crochet. I've always followed the pattern exactly in the past, but this time I decided to make my own Kumihimo braid for the drawstrings. There are some disadvantages and advantages to going this route. I had to make several sample braids before determining which thread to use. I really wanted to use rayon floss, but I couldn't seem to get an even tension. No one would have noticed but me, but I wanted it to be as near perfect as I could get it. I wound up using the same size 20 Cebelia that I used for the bag. I needed two 18" pieces of cording, and each one took me a full day to make. There are 12 beaded tassel loops on each side of the bag, making it much heavier than what I've made in the past. I didn't have time to determine if there was a way to make fewer tassel loops to make the bag lighter, but I like the look, so I guess it really doesn't matter! As for advantages, I was able to attach the beaded tassels much more securely than with the method given in the pattern. Hmmm... I guess that's the only advantage I can think of right now! The hanky is linen. I knew I wouldn't have time to tat an edging out of finer thread, so I used size 20 Cebelia. I think it works with the linen hanky, because the fabric is not as light weight as the cotton hanky blanks I have. Besides, I like the look of "heavy" lace... it looks very Irish to me, and I am part Irish! I've received many wonderful goodies in the mail in the past week or so. I can't wait to share them with you, but I need to wrap presents, get cleaned up, and drive to the shower, so I guess I'll have to do that later.